For consistent high-quality output from your Zebra card printer, use Zebra's TrueColours® print ribbons. TrueColours ribbons deliver vibrant color photos and "true-to-life" flesh tones, as well as sharp monochrome bar codes and text. Prolong card life with Zebra's patented overlay ("O panel") in the ribbons, which protects your card against dye migration and abrasions. 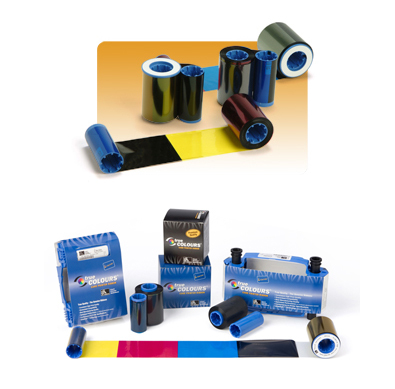 TrueColours ribbons are also designed to help extend the life of your Zebra card printer with a unique silicone-based coating that minimizes printhead debris. Ribbons without this coating allow particulate build-up on the printhead, which may decrease the life of this critical printer part. Zebra TrueColours® Monochrome Resin Ribbons use "thermal transfer" printing technology, a process by which a heated printhead is used to transfer a digitized image from the ribbon to the surface of the card. Monochrome ribbons can be used on all Zebra card printers. They are available in a variety of colors including black, red, green, blue, gold, silver, white and scratch-off gray. Zebra TrueColours® Multi-panel ribbons are developed with the newest technology in dyes available. Multi-panel ribbons use dye-sublimation, which means the color dye is vaporized into a gaseous state and then diffused onto the cards at the printhead station. Prevent unauthorized use of your card printer and supplies with print ribbons that have factory programmed customer security codes. The printer will authenticate the ribbon security code before printing, helping keep your ID issuance process secure.